If you’re lucky enough to be in the position to renovate an old home, there are ways to do it without sacrificing the charm that makes the property so unique. 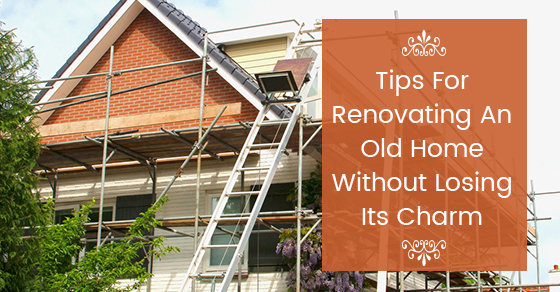 Here’s how to restore an older home and keep its magic. When it comes to home renovations, the outside is equally as important as the inside. Keep the home’s vintage curb appeal by fixing up the outside without replacing the entire facade. Instead, resurface the porch while keeping the wood the same colour that it once was and order new custom windows that look vintage but are actually energy efficient. One of the more important things to remember about keeping up the curb appeal of an older home is to stick with vintage colour schemes. An older home will look out of place if it’s painted in bright, bold colours. During the renovations you can gut the entire inside of the home but still keep the structure intact. This may prove challenging if you are not a construction professional. However, you can hire a renovation team that specializes in remodelling historical and older homes. When you work with a professional renovation company, they’ll ensure that the details that make your home so charming aren’t damaged and can be put back in. These details can be anything from the bannister that lead upstairs to the fireplace in the living room to the crown mouldings. In the olden days, homes weren’t designed with function and flow in mind. In order to create space in your new home, consider opening up the dining room or living room. Removing walls will allow you to get more space in your older home without sacrificing its vintage style. Just because the home you are working on is older doesn’t mean you can’t incorporate contemporary elements into it. When you’re redoing the home, see where contemporary elements won’t look out of place. For instance, the kitchen may be old-fashioned in its overall look, but you can still add modern appliances. You also don’t have to use a clawfoot tub in the bathroom just because that’s something that was in style when the house was built. If you’d prefer a stand-up shower, go for it. Mixing in modern touches with the older style of your home can create the perfect balance between then and now. If you are having trouble renovating your old home, contact us. We specialize in the restoration and remodelling of heritage and older homes.